I'm so excited about these Vegan Chocolate Citrus Muffins I made today! ..
Dainty snowflake-covered trees and a chilly frost in the morning air meant I simply had to make vegan muffins! But this time I wanted to wake my husband up to the delightfully intoxicating aroma of citrus, melted chocolate and spice. 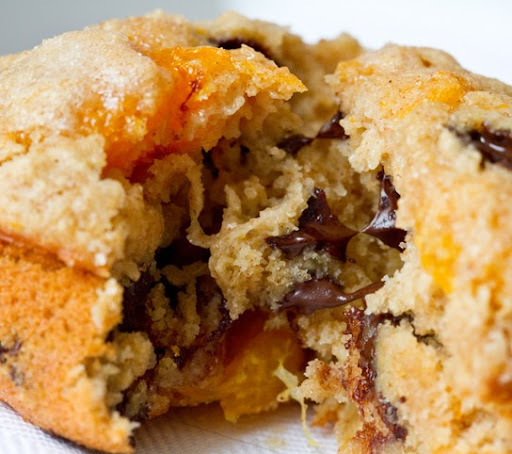 I used sweet clementines instead of oranges to make these muffins sweetly sing. 1. Preheat the oven to 375 degrees. Grease or line your muffin tins. 2. Combine all your dry ingredients in a mixing bowl. 3. Add in your wet ingredients and fold well until smooth. 4. Fold in your chocolate chips. 5. Spoon muffin batter into the tins. Top each muffin with a dab of vegan buttery spread and a sprinkling of sugar. 6. Bake at 375 for 18 minutes or until the edges of the muffins brown and crisp.